The term millennial is an overused buzzword that nearly all 93 million members of the “me” generation are tired of hearing. Still, it seems as if most marketers don’t understand that, with more than $1 trillion of annual buying power, there’s more to the demographic than selfies and hashtags. In October 2015, Time reported that 22 million people born between the late ’70s and ’90s have children and that each day the age group gives birth to roughly 9,000 babies. Millennials aren’t becoming parents—they’ve been parents, and their consumer impact proves it. Their total spending power? $200 billion. The influence of engaging millennial parents extends beyond their dollar and is reflected in the generation’s values and habits. The Pew Research Center conducted a series of analysis on how the group varies in comparison to their Gen X and baby boomer predecessors. Unlike previous generations, millennials are more racially diverse and are less likely to identify with a specific political party or religious organization. They also have higher expectations for brands and hold companies accountable for their actions. An overwhelming number of millennials (81%) expect brands to publicly address social issues, and 42% are eager to alter the landscape of consumer products by co-creating new products and services with their favorite companies. With the average millennial having 250 Facebook friends and 90% of millennial parents admitting to finding social media helpful, ignoring this subset is a giant missed opportunity. But communicating using the same messages delivered to previous generations of parents won’t work either. You need to thoughtfully engage on social media by listening, being honest and continually evolving your strategy. Too often legacy brands such as Barbie refuse to adapt to meet consumer behaviors in a timely manner. That’s just one of the many reasons why Barbie’s dramatic makeover and successful rebranding campaign is such an anomaly. According to Time, from 2012–14, Barbie’s sales dropped by 20%, costing the brand an estimated $500 million. In 2014, Lego surpassed Mattel as the biggest toy company in the world, and Elsa (the doll from “Frozen”) kicked Barbie out of her dream house to become the most popular girl’s toy in America. The conversation surrounding the brand on social media was hostile. 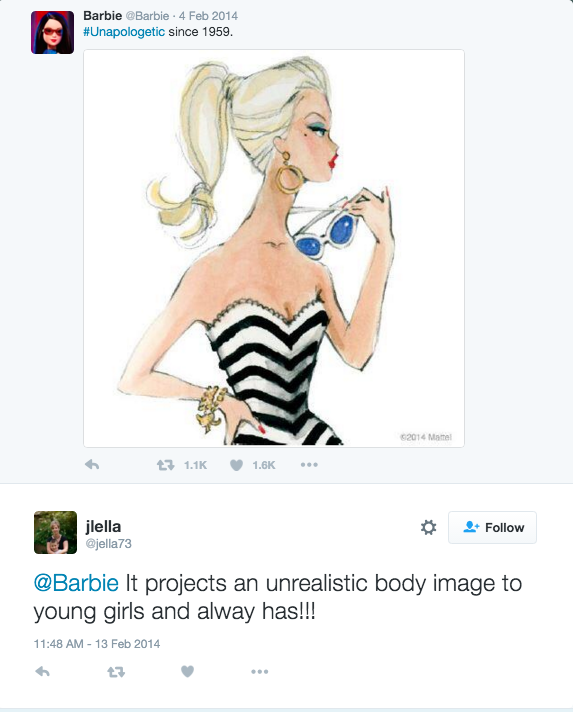 To make matters worse, one of the brand’s designers was quoted saying that Barbie’s proportions weren’t intended to be realistic. Sales and sentiments on social showed that millennial parents no longer believed the doll was a proper role model. In order to survive, Barbie needed to evolve. The brand spent the next two years redesigning its iconic doll. During this time, Barbie was repositioned with a revised digital and social marketing strategy that directly addressed the concerns of millennial parents. The first major indication that Barbie was changing came in October 2015, when the brand released a two-minute online video titled “You Can Be Anything.” The unscripted ad empowers young girls by putting them in professional settings and encouraging them to imagine their full potential. With more than 20 million views on YouTube, the online video proved a massive success. Ace Metric reported that the video surpassed industry benchmarks with a 36% likability score and an emotion score of 92. The metric that likely mattered most to Mattel—change in brand perception—was the most telling. The online video received a 752 change score, 35% higher than the average commercial. 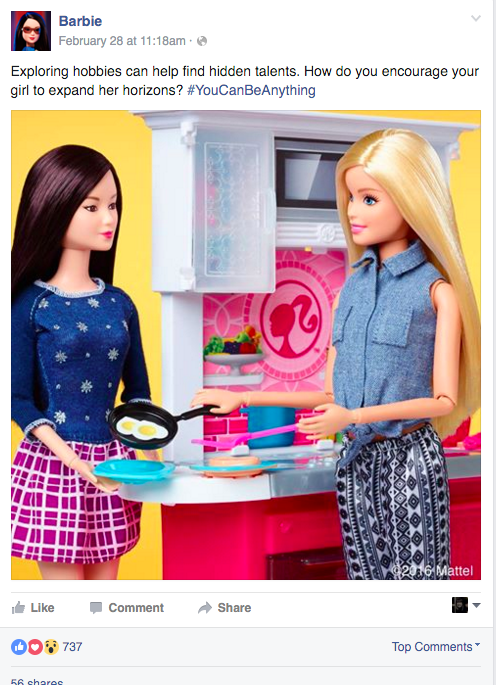 Barbie was officially on the road to becoming relevant again. On social, the Barbie brand supported its digital video efforts with content focused on female empowerment. The brand adopted the hashtags #TheDollEvolves and #YouCanBeAnything, and in its social post copy, Barbie began to directly address young parents. On Facebook, Barbie prompted engagement by asking, “How do you encourage your girl to expand her horizons?” On Twitter, the messaging was similar. Mattel’s efforts cumulated in 2016, when in a Time cover story, the brand announced the release of three new, diverse Barbies available in tall, petite and curvy. The new product launch was promoted almost entirely online, specifically on social media. According to Digiday, initial estimates indicate that 90% of the interactions online were positive. On the product release date, there were more than 65,000 Tweets about the new dolls. The branded hashtag #TheDollEvolves alone accounted for up to 15,000 of those mentions. What can brands learn from Barbie’s success? Listen to your consumers, even when it’s tough to hear what they’re saying. Don’t be afraid to implement radical change. And, what’s most important, take a strong stance to clearly communicate your messaging across all of the digital and social networks your audience is active and engaged on. Brands are repeatedly being told that in order to attract millennials they need to remain authentic. But what does that even mean? Plum Organics discovered the answer in its “Parenting Unfiltered” campaign. The organic baby-food brand found that 61% of millennial moms feel pressure to keep up with their friends on social media. Meanwhile, Time reported that 8% of millennial parents are left feeling inadequate after seeing social posts from other parents. Plum Organics aimed to relieve young parents of the societal pressure to be perfect by keeping it unapologetically real through a series of digital videos distributed on Facebook and Twitter. The videos show a mom pumping breast milk at work, a dad Googling the answer to a parenting question and parents candidly talk about maintaining a work-life balance. Shared on social with the hashtag #ParentingUnfiltered, the digital advertisements are in stark contrast to how brands and the media usually capture parenthood. According to Sprout’s Twitter Keyword Report the #ParentingUnfiltered has gained a total volume of 1,898 on Twitter since the campaign’s launch in April 2015. The brand has been able to sustain its positioning with an influencer program and a microsite on Tumblr that showcases UGC from customers who are willing to embrace and share their “imperfect” parenting moments. Plum Organics encourages, recognizes and thanks its influencers and followers for sharing their candid, intimate moments. Seeing as 62% of millennials admitted to being more loyal to a brand that engages with them on social, this simple extra effort can go a long way when it comes to purchase intent. Noelle Porcoro is the Senior Brand Manager at Just Born Quality Confections (the company that produces PEEPS). In an interview with the New York Post, she said that, while the brand is established with older moms, PEEPS is looking to start attracting a younger parental demographic. In order to do this, the nostalgic candy company decided it was time to launch its first digital advertising campaign. The goal of the brand’s digital efforts is to get millennial moms buying PEEPS prior to the eight weeks leading up to Easter. Porcoro hoped that the digital campaign would increase demand by 10%. PEEPS annual yearly sales growth currently falls in the “low single digits,” Porcoro told the Post. The brand’s social media strategy also aims to target younger moms. An Exponential report on advertising to millennial moms revealed that 38% are active on Pinterest. The report also noted that 84% of 18- to 34-year-olds are interested in attempting craft projects in order to save money. With 40% of PEEPS used for craft projects, set on fire or heated in the microwave, the brand identified an opportunity and capitalized on the DIY trend on social. 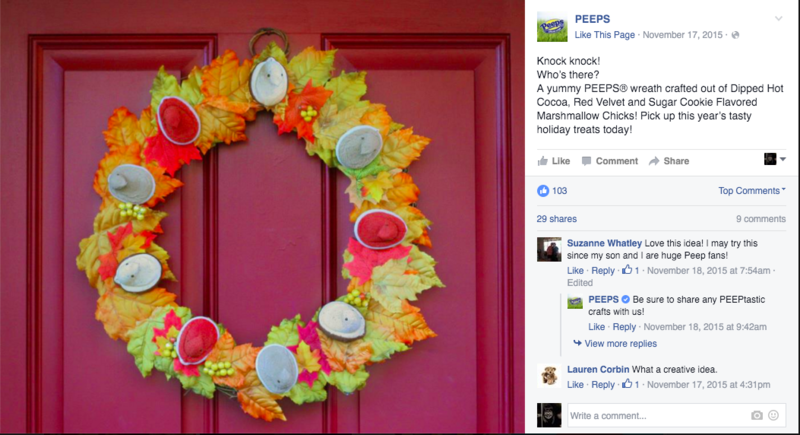 On Pinterest, Facebook, Instagram and Twitter, the brand provides fans with new ways to use PEEPS, from crafting a festive fall wreath to using the marshmallows in a brownie recipe. PEEPS is a 63-year-old brand that’s able to find success with millennial parents by acclimating to the changes in marketing and embracing the demographic’s pastime. The brand was willing to take a chance on an advertising format it wasn’t familiar with and isn’t afraid to tailor its social media strategy to reflect the nature in which consumers were actually using the product. Understanding the hobbies that appeal to this demographic and identifying how your brand can tap into these interests will guide your social strategy and, ultimately, increase social media engagement. When it comes to engaging millennial parents, just being on social isn’t enough. Brands need to realign their strategies to match the habits and behaviors of millennial parents. Whether you’re an iconic toy brand, an organic baby-food company or a candy company rooted in nostalgia, you have to implement impactful product changes, provoke meaningful conversations on social media and craft a content strategy that resonates.